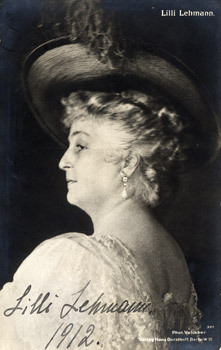 Lilli Lehmann (November 24, 1848 Würzburg - May 17, 1929 Berlin) was a German operatic soprano. Her mother Maria Theresia Löw (1809 - 1885) was Jewish. Her first lessons were from her mother who was a prima donna under Spohr at Cassel. 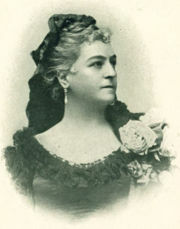 After singing small parts on the stage she made her debut in 1870 in Berlin as a light soprano in Meyerbeer's Das Feldlager in Schlesien in 1870 and became so successful that she was appointed Imperial chamber singer in 1876. She sang in the first Bayreuth Festival, in 1876, sang in London in 1884, and appeared at the New York Metropolitan Opera from 1885-1890. It was there that, together with Fischer, Alvary, Brandt, and Seidl, she helped accomplish the final triumph of Wagner's music.
. . . Her art is enduring as it is great. She is equally successful in colorature and dramatic rôles ; but her physique and voice are particularly fitted to the mythical Wagnerian characters. Lilli Lehmann imparts to these legends of the Norseland all the attributes our fancy calls for. Her Scandinavian goddess is a creature of mighty emotions, heroic build, and a voice at times like the fierce north wind. Her cry of the Walküre is a revelation in the art of tone-production. In 1870 Lilli Lehmann was engaged for the Berlin Opera-House. . . . For fifteen years Lilli Lehmann sang in Berlin with an occasional flight to Baireuth under the kaiser's permission, where she sang for Wagner himself. " I was one of the Rhine daughters, and also the first Forest Bird in ` Siegfried.' " . . .
We stayed to a meal with the Wagners, during which he talked much about vegetarianism that he wanted to adopt entirely, but his physician was opposed to it. After what I know of it to-day from my own experience, I am certain that Wagner, without going to the extremes of vegetarianism, would have found it a means of lengthening his life. [refers to an ilness in March 1892:] The adoption of a vegetarian diet, which had been so often recommended to me by Professor Karl Klindworth and Eugen d'Albert, I succeeded, two years afterwards [this appears to mean 1894], in establishing by degrees from one day to another, and even after a fortnight, I had to admit that there was an extraordinary quieting of my nerves. I owe the complete cessation of my agitation before my public appearances and in other affairs of life to moderate vegetarianism; I became strong and healthy again, and could still endure exertions in my vocation from which the youngest and strongest might shrink. Thanks to vegetarianism, Klindworth, who had suffered for many years from a serious complaint, is now eighty-three years of age, and in complete possession of his bodily and spiritual powers. [April 1899] I lived as a strict vegetarian, moreover, ate extremely little and felt very well, in spite of all the exertion at the theatre and literary labour at the house, for my book, How to Sing, demanded to be completed. Note: In 'The Vegetable Passion' by Janet Barkas (now Jan Yager), published in New York, 1975, page 103 of the paperback edition, the author claims that Wagner forced his followers to go vegetarian, and that "Llli Lehmann was one of many who carried out his iron will" - which is clearly nonsense if she was not vegetarian until 1894 - after Wagner's death. This probably wouldn't matter if it were just in an obscure, long out of print, book from 1975. But, unfortunately, the section on Wagner was copied, almost verbatim, by Colin Spencer in 'The Heretics Feast' pp.282-283, first published 1993 in London - later re-titled as 'History of Vegetarianism'. Spencer cites Barkas as his only reference on Wagner, though a comparison of the texts shows that he did rather more than merely 'refer' to her, and he did no other research of his own.